The impermanence of the world leads to a restlessness of the spirit. Acquainting oneself with the glories of the Lord gives peace of mind according to the Bhagavata Purana. Bhakti Yoga or the path of devotion is said to be the easiest way as it does not involve extensive yogic practices. It is the path for fostering love in God, having faith in him and surrendering to him. The term ‘Bhakti’ is said to be derived from the word ‘bhaj’ which means to be’ attached to God’. It is love for love’ sake where the devotee has no selfish expectation and wants God and God alone. It binds the heart of the devotee with the lotus feet of the Lord. It is supreme attachment and intense devotion to God. First the devotee has to have unshakeable faith followed by attraction and then adoration. Then desires have to be suppressed so that attachment to God can grow and slowly it leads to supreme love. This leads to union and oneness with the Lord. Bhakti should not be mistaken for emotionalism as it requires a thorough training of the mind and will and disciplining at every stage. All activities must be carried out to awaken the emotion of Bhakti. Practice of right conduct, worship, devotional singing, satsanga, visiting holy places, company of the holy, service to the poor and sick, compassion to all etc are all aids to develop bhakti. Just like there are various kinds of bhakti like Apara bhakti for beginners like worship, chanting, performing rituals etc and Para Bhakti where the devotee sees the Lord as all pervading, there are different kinds of Bhavas in Bhakti like Shanta or peaceful kind of devotion like Bhishma, Dasya or servant attitude like Hanuman, Sakhya or friendship towards the Lord like Arjuna, Vatsalya or God is regarded as one’s child like Yashoda and Madhurya where God is regarded as one’s lover like Radha. The fruit of Bhakti is Jnana and even Jnanis like Adi Shankara after realisation took to Bhakti to enjoy the sweetness of their love with their Lord. The best example of devotion in Hinduism which strikes a chord within every soul is the poignant and touching story of the child Prahalad. The unparalleled story of his unflinching love for Lord Vishnu amongst all odds and his tenacity of purpose inspite of his tender age has made him a beacon of light and an inspiring model in the annals of history for all those who wish to tread the path to salvation. Hiranyakasipu and Hiranyaksha were two Asura brothers who hated Lord Vishnu and went about terrorising all those who worshipped him. They were actually in a previous birth the gatekeepers of Vishnu named Jaya and Vijaya who were cursed by the Kumaras the Manas Putras of Brahma to lose their divinity and be born as mortals on earth. The gatekeepers rushed to Vishnu for forgiveness but Vishnu said that he could not reverse the curse. Instead he gave them two options. They could take seven births on earth as devotees of Vishnu or they could take three births as his enemy. After serving either of the sentences, they would be reunited with Vishnu in Vaikunta. Since they could not bear to be parted from Vishnu for seven lifetimes they chose the second option. Thus they were born as enemies of Vishnu and harboured immense hatred against him. When Lord Vishnu incarnated as Varaha(boar) to save Mother Earth and kill Hiranyaksha, Hiranyakasipu was enraged and went on a rampage destroying everyone on earth. However the Devas led by Indra tried to defeat him. Meanwhile as he was performing his austerities, his wife was enceinte and the Devas feared that once out of the womb, his son too would be like him. Thinking thus they attacked his kingdom and Indra carried away his wife. But the great sage Narada intervened and stopped Indra and reassured him that the child born would be an antithesis of his father and a great devotee of Lord Vishnu. He then took Hiranyakasipu’s wife to his hermitage and told her the glories of Lord Vishnu. This was absorbed by her unborn child Prahalad. But Hiranyakasipu had performed severe penance to defeat Vishnu and Lord Brahma had granted him a boon which made him almost invincible. He had obtained a boon whereby he couldn’t be killed by any man or animal, by anything living or non living, on earth or in the sky, during the day or night. He became arrogant and felt he had gained immortality and began considering himself as God. He forced everyone to worship him by chanting ‘Om Namo Hiranyakasipu Namah’. After Hiranyakasipu obtained his boon he returned to the palace to find his wife in Sage Narada’s hermitage. He then took her back to the palace where she soon gave birth to a son whom they named Prahalad. His father loved him dearly. He was a sweet and affectionate boy. Soon it was time for his education and the King sent him to the school where his teachers were Chanda and Amarka who were the sons of Shukracharya the preceptor of the Asuras. Along with the other students they taught him that Dharma (Righteousness) and Moksha(Liberation) were not important and only Artha(wealth) and Kama(desire) were of great importance. They taught them to worship Hiranyakasipu as God and imparted all teachings on demonic qualities which were opposed to Lord Narayana. Prahalad pretended to listen to keep the Gurus happy but he did not imbibe any of these qualities. His heart and mind were filled with Lord Narayana. After a few days Hiranyakasipu was eager to know what his son had learnt. Prahalad began to sing the glories of Lord Narayana. Hiranyakasipu was stunned and could not imagine how his son could worship his arch enemy Vishnu. He sent the boy back with warnings to the teachers to find out who was influencing him at school. The helpless teachers questioned him closely as they feared the King’s wrath. They tried several methods to change his mind and took him back to the King. But yet again Prahalad could only speak about Lord Vishnu. The teachers trembling in fear explained to the King that they had tried their best but the boy admitted that he had learnt it elsewhere and they were loyal subjects of the King who were not to blame. Now the anger of the King turned to his son. He asked him as to who had taught him such evil things. Prahalad said that it was Lord Vishnu who had taught him and asked his father too to turn towards the Lord before it was too late. Hiranyakasipu was furious and asked his guards to kill the child. The guards were stunned to kill such a tender and innocent boy but they feared the King’s anger and began to obey him. They struck him with their swords but not a hair was hurt. Hiranyakasipu was amazed. He now asked for elephants to trample him. Everyone watching the scene trembled but Prahalad stood calm, his heart and mind absorbed in the Lord. Nothing happened and he remained unscathed. The King’s anger knew no bounds. He ordered him to be thrown into the river. But Prahalad joyously floated in the waters chanting the sacred names of the Lord. They then pushed him from a mountain but he came back to his father unhurt. Then he was thrown into the fire but he came out without a single injury. Snakes were released to bite him but their venom had no effect. Poison was given to him but it too had no effect on him. It seemed to everyone that wind, rain, sun, snow, nothing could harm him. Hiranyakasipu was stunned. But he was also extremely worried. He just could not fathom how such a tender child could have such amazing powers. The teachers then informed the King that they would take him back to the ashram and request their father Shukracharya for advice. They stated that maybe these quirks of Prahalad would go when he grew up and he would become sensible. So saying they took him back to the ashram. But this time Prahalad began to influence the other students. He began to advise them not to waste their lives and to obtain the grace of Lord Vishnu before it was too late. He then told them the story of his past and the truths of Bhagavata Dharma that he learnt in the womb of his mother from Narada. Seeing the other students too trying to follow Prahalad the teachers were worried and began to tell Prahalad about the death of his uncle and the grandeur of their King who sought revenge on Vishnu who was the killer of his uncle Hiranyaksha. 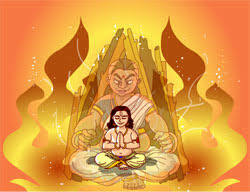 But Prahalad was unimpressed and when the Gurus saw the situation losing control they went to the King in helplessness. The angry King asked Prahalad how he could dare to defy the King and who gave him the courage to behave in this way. When he said that it was the omnipotent and omniscient Lord Hari who was present everywhere, Hiranyakasipu in anger struck at the pillar and asked him if Vishnu was present in the pillar also and charged to kill the boy with his sword. Suddenly there was a deafening thunder like sound as if the universe was splitting into two. Everyone shook with fear. For from the pillar emerged Lord Narayana in the form of Narasimha with the head of a lion and a body of a man. His eyes were dazzling, his face, hair, beard everything gave him a ferocious appearance. He caught hold of Hiranyakasipu and sitting on the threshold, put him on his lap and with his nails tore his body open. It was twilight. All the conditions in Hiranyakasipu’s boon were satisfied. Then destroying all the other demons he sat on the throne glaring at everyone, still full of anger. The Gods showered flowers on him from heaven but yet his anger did not diminish. Then Prahalada touched the lotus feet of the Lord. Seeing him, the Lord melted and he asked him to ask for whatever he desired. Prahalad said that he wanted nothing but unalloyed devotion to the Lord. He asked that his father be pardoned and granted liberation. The Lord agreed and blessing him, the Lord asked him to rule the kingdom justly and wisely at the end of which he would be united with him. 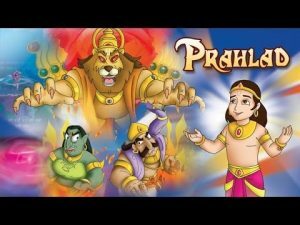 Prahalad ruled wisely and the land prospered. He won vast fame and there was peace everywhere. He spread virtue and righteousness. After his death he attained a place in the abode of Lord Vishnu. 1. Shravanam or hearing the stories of the Lord’s glories like King Parikshit. 2. Kirtanam or singing his glories like Chaitanya Mahaprabhu, Narada, Tyagaraj and Mirabai. 3. Smaranam or remembering his name and his presence at all times like Dhruva and Prahalad. 4. Padasevanam or serving at the Lord’s feet like Lakshmana. 5. Archanam or worshipping the Lord by external or internal means like King Ambareesha. 6. Vandanam or prayer and prostration at the lotus feet of the Lord like Uddhava and Akrura. 7. Dasyam or serving the Lord with devotion like Hanuman and Garuda. 8. Sakhyam or cultivation of friendship with the Lord like Arjuna and Sugreeva. 9. Atma Nivedanam or self surrender or absolute love for the Lord like Radha, Bali and Kannappa Nayanar. According to Prahalad, a devotee could take up any of these paths to reach the highest state. It takes the devotee from the individual to the Supreme state and grants liberation. The story of Prahald is a motivating one which teaches everyone that age and race are no impediments to the path of devotion. Steadfastness, one pointedness and surrender are the pre-requisites to success in the spiritual path. The devotee rising above dualistic concepts slowly reaches the state of non dualism where he sees his beloved in everyone, hence has immense compassion and love for mankind. Such a devotee purifies the very ground he walks on. Such a great soul was Prahalad, though tender in years but born for the sake of humanity to lead other souls towards Godhood and liberation.